A doctor is being hailed a hero for stopping a double-amputee patient who opened fire in the emergency room of a veterans hospital in South Florida on Wednesday night. The patient, 59-year-old Larry Ray Bon, came to the West Palm Beach VA Medical Center in Riviera Beach for treatment but became combative with staff members and was taken to the emergency room. Shortly thereafter, he pulled out a small handgun from his electric wheelchair and started firing as he was about to undergo a mental health evaluation around 6:30 p.m. local time. Two doctors, identified in a criminal complain as B.G. and E.A., heard approximately three shots before they were confronted by Bon, who was screaming about cigarettes. Hoping to distract Bon, B.G. told him that there were cigarettes behind him before rushing Bon in an attempt to disarm him. As the two struggled, Bon fired approximately three more shots, one of which grazed B.G. 's left ear before entering his neck and exiting near the base of his skull, according to the complaint. B.G. was able to gain control of the handgun and pass it off to E.A., but as Bon attempted to grab it from her, the gun was passed to other staff in the room. Bon continued trying to attack E.A. until a patient helped her to pin Bon against a wall with a chair as they waited for police to arrive, the complaint said. Justin Fleck, assistant special agent in charge at the FBI's Miami field office, said that the wounded doctor was "very brave." "I'm not going to release his name at this time, but he's doing well, and he did a heroic thing today," Fleck told reporters Wednesday night. "Probably saved a lot of lives." 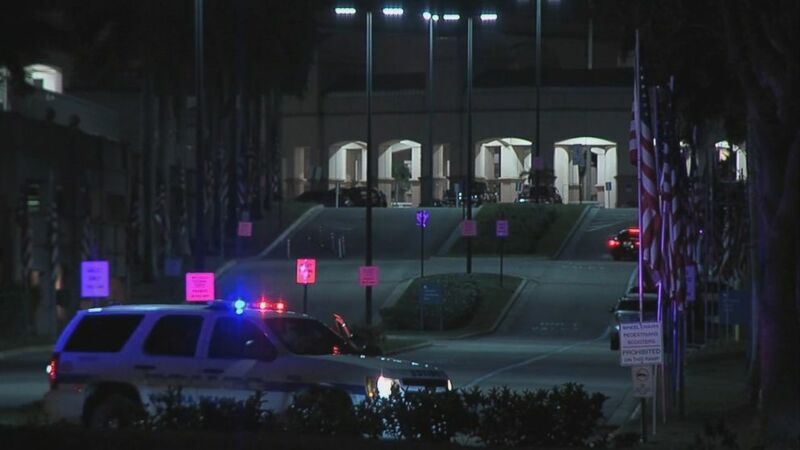 (WPBF) A wounded doctor helped subdue an active shooter at a veteran's hospital Wednesday night in Florida. The doctor was taken to a nearby hospital "for further treatment and evaluation and is in stable condition," according to a spokesperson for the U.S. Department of Veterans Affairs. On Wednesday night, the spokesperson told ABC that "the facility is secure and will remain operational for scheduled appointments and procedures tomorrow." It was later discovered that a second employee at the hospital was struck in the buttocks by one of the fired rounds. Bon is from Michigan but recently was living in the West Palm Beach area, according to Fleck. It's unclear whether Bon, who is missing both legs from the knee down, is a veteran. "We believe he may be homeless here in the area," Fleck told reporters. "If anybody is familiar with him and can provide us any information about where he might be staying at, or some associates that could help us paint the picture of who he is, we'd appreciate a call into the FBI."